An international team of scientists has conclusively demonstrated a connection between white dwarf stars that fail to completely detonate and a class of oddly dim supernovae. Supercomputer simulations have revealed that a type of oddly dim, exploding star is probably a class of duds—one that could nonetheless throw new light on the mysterious nature of dark energy. Most of the thousands of exploding stars classified as type Ia supernovae look similar, which is why astrophysicists use them as accurate cosmic distance indicators. They have shown that the expansion of the universe is accelerating under the influence of an unknown force now called dark energy. Yet approximately 20 type Ia supernovae look peculiar. “They’re all a little bit odd,” said George Jordan, a research scientist at the University of Chicago’s Flash Center for Computational Science. Comparing odd type Ia supernovae to normal ones may permit astrophysicists to more precisely define the nature of dark energy, he noted. Jordan and three colleagues, including his chief collaborator on the project, Hagai Perets, assistant professor of physics at Technion – Israel Institute of Technology, have found that the peculiar type Ia supernovae are probably white dwarf stars that failed to detonate. “They ignite an ordinary flame and they burn, but that isn’t followed by a triggering of a detonation wave that goes through the star,” Jordan said. These findings were based on simulations that consumed approximately two million central processing unit hours on Intrepid, the Blue Gene/P supercomputer at Argonne National Laboratory. Full details of the simulations will appear in the Astrophysical Journal Letters. The triggering of a detonation wave is exactly what happens in normal type Ia supernovae, which incinerate white dwarfs, stars that have shrunk to Earth size after having burned most or all of their nuclear fuel. Most or all white dwarfs occur in binary systems, those that consist of two stars orbiting one another. Peculiar type Ia supernovae are anywhere from 10 to 100 times fainter than normal ones, which are brighter and therefore more easily detected. Astrophysicists have estimated that they may account for approximately 15 percent of all type Ia supernovae. The first in this class of exceptionally dim supernovae was discovered in 2002, noted Robert Fisher, assistant professor of physics at the University of Massachusetts Dartmouth, a co-author of the paper. Called SN 2002cx, it is considered the most peculiar type Ia supernova ever observed. The dimmest of the lot, however, was discovered in 2008. “If the brightness of a standard supernova could be thought of as a single 60-watt light bulb, the brightness of this 2008 supernova would be equivalent to a small fraction of a single candle or a few dozen fireflies,” Fisher noted. 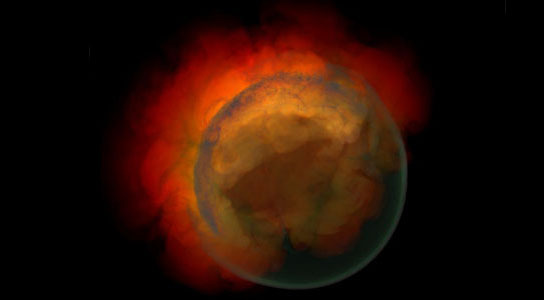 Flash Center scientists have been successfully simulating type Ia supernova explosions following the gravitationally confined detonation scenario for years. In this scenario, the white dwarf begins to burn near its center. This ignition point burns outward, floating toward the surface like a bubble. After it breaks the surface, a cascade of hot ash flows around the star and collides with itself on the opposite end, triggering a detonation. “We took the normal GCD scenario and asked what would happen if we pushed this to the limits and see what happens when it breaks,” Jordan said. In the failed detonation scenario, the white dwarf experiences more ignition points that are closer to the core, which fuels more burning than in the detonation scenario. “The extra burning causes the star to expand more, preventing it from achieving temperatures and pressures high enough to trigger detonation,” noted co-author Daniel van Rossum of UChicago’s Flash Center. Instead of detonating, the white dwarf remains intact, though some of the star’s mass burns up and gets ejected from its surface. This failed detonation scenario looks quite similar to the peculiar type Ia explosions. The simulations resulted in phenomena that astronomers now can look for or have already found in their telescopic observations. Normal type Ia supernovae display a relatively uniform appearance, but the asymmetric characteristics of their peculiar cousins means that the latter will often look much different from one another, depending on their viewing angle from Earth. The asymmetric explosion also produces the kick, which is possibly powerful enough to release the white dwarf from the gravitational hold of any binary companion it may have had. This can produce a peculiar type of hyper-velocity white dwarf, the fastest of which might even escape the galaxy. Smaller kicks might leave the binary system intact, but also push the white dwarf into a tight and highly elliptical orbit around its companion. Most white dwarfs orbiting close to their companions display a more circular orbit. Typical white dwarfs have compositions of carbon and oxygen, yet some of the simulated ones that failed to detonate displayed heavy elements such as calcium, titanium and iron. When the detonation fails to happen, much of the ejected mass falls back onto the surface of the white dwarf, where the heavy elements become synthesized. Research paper: George C. Jordan IV, Hagai B. Perets, Robert T. Fisher, and Daniel R. van Rossum. Failed-detonation supernovae: sub-luminous low-velocity IA supernovae and their kicked remnant white dwarfs with iron-rich cores. 2 Comments on "Exploding Star Could Shed New Light on the Nature of Dark Energy"
I failed to see how these findings may help “…to more precisely define the nature of dark energy”. Some elongation on that point would be very nice. The dim la supernovae which is about 15% of all the other,otherwise bright supernovae, due to big explosion accompanying its brightness, is the candidate chosen for identifying the Dark Matter and Dark Energy which is 96% of the cosmos. The explosion is dampened by anti-gravitational forces of dark energy surrounding them, which sends them to fly off at hundreds of miles per second and also take an orbital motion around its binary (always for a supernova)companion almost circular. Dark Matter and Dark Energy is always manifested by their anti-gravitational forces around a galaxy sending them flying off against their natural gravitational clumping to give an ever expanding universe. Gravitational lensing method is the sound proof of Dark Matter which is spread in cosmos an-isotropically rather. Since the chosen 100 supernovae are almost equidistant by the candle method of their brightness, 15% of them are dim la supernovae in the locus. This is taken as an indirect additional proof for existing Dark Energy. Dark Energy can be established only by such indirect proofs. Thank You.